Snowflakes, flurries, an ice castle too, nothing short of the Frozen Water Slide & Bounce House Combo Rental will do! This pink, blue and purple waterslide bounce house will fit all your little ones' Frozen party theme, while also keeping your guests both cool and entertained. Your bouncers will begin their fun journey through the tunnel entrance into the large 15' x 15' bounce house area. But the fun doesn’t stop there - climbing the safety-padded foam steps from inside the bounce house to the 7' high enclosed slide platform area, your little ones will enjoy a little relief from the heat under our custom misting sprayer, before sliding down the 7' water slide to finish safely in the splash landing area. Feel safe when your little ones bounce and slide on this inflatable water slide rental: this bounce house water slide combo has many safety features, including mesh windowed walls around the bounce house so you can better supervise your little jumpers, roof egress port above the bounce house, overhead canopy at the top of the inflatable water slide platform, bumper rails the length of the inflatable water slide, and bumpers at the end of the inflatable water slide landing area to ensure no one slides directly onto the ground. This bounce house water slide combo also includes an excellent entrance safety tunnel, ensuring that users will not fall off the sides of the ramp as they enter the bounce house water slide combo. Your party is snow joke, so make it splashtastic with the Frozen Water Slide & Bounce House Combo Rental! Safety is our top priority, above everything, EVEN FUN (sorry, kids!). 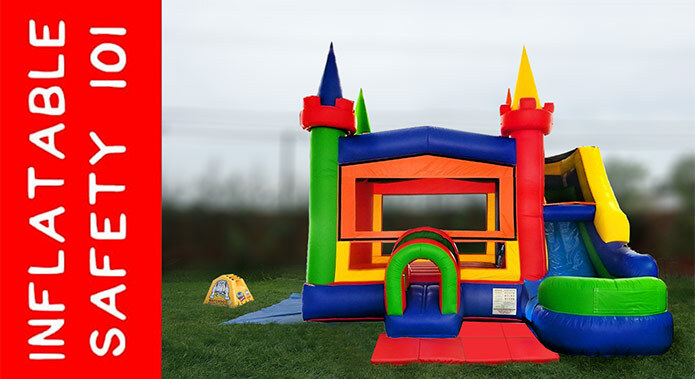 This bounce house water slide combo rental includes a Watchdog Series 2 Blower Siren (to detect blower malfunction or other loss of air) and ASTM-approved, 2" thick, non-slip safety/landing mats (to create a safer area around the entrances/exits of your bounce house water slide combo rental), as well as 18" stakes to properly anchor your bounce house water slide combo rental - all free of charge! While we do our best to source the safest inflatable rentals, slips, trips and falls can occur, especially without proper supervision to ensure all Inflatable Safety & Operating Instructions are followed at all times.